Preheat the oven to 350°F. Grease a 9-inch pie plate with cooking spray. Generously flour your work surface. Divide the sugar cookie dough into thirds. 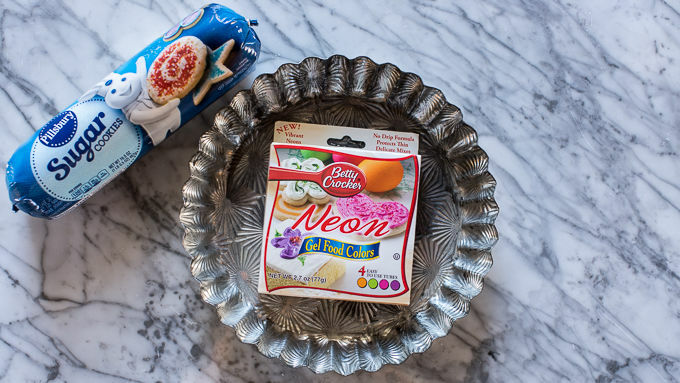 Working with one piece of dough at a time, knead 1-2 drops of food coloring into the dough until smooth. Repeat with the remaining dough, but use a different color for each 1/3 of dough. 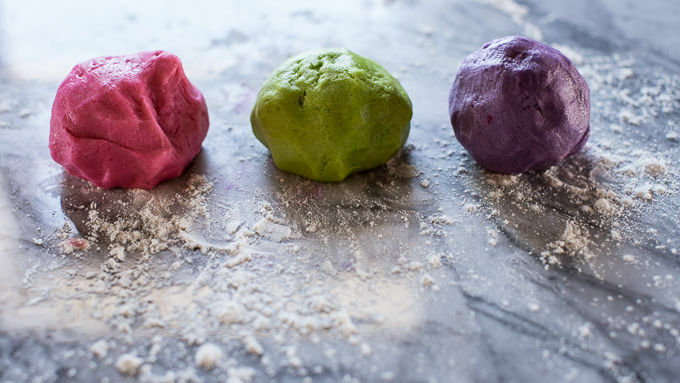 You should end up with three different colored balls of dough. Lightly flour your work surface once more and roll each round of dough out into roughly a 9x6 inch rectangle. Carefully stack each sheet of dough on top of each other. Gently press down on the top to adhere the sheets of dough together. 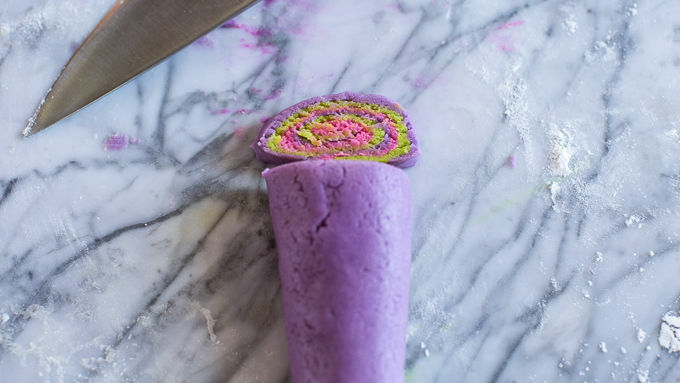 Roll up tightly into a layered log and slice into 1/2-inch rounds, as you would with slice-and-bake cookies. Press the rounds, flat side down, evenly into the bottom and sides of a 9-inch glass pie plate to form a crust. Place the pie plate on a baking sheet and bake for 25-30 minutes or until the crust is lightly golden. Remove and let cool completely before filling. I like to place my crust in the freezer to get it really chilled. Meanwhile, remove the ice cream from the freezer and allow it to sit on the counter for 5-10 minutes to soften slightly. In a large bowl, combine the softened ice cream and marshmallow fluff. Do not completely combine; you just want the marshmallow fluff to swirl with the ice cream. Pour the mixture into the cooled crust. Freeze for at least 3 hours. 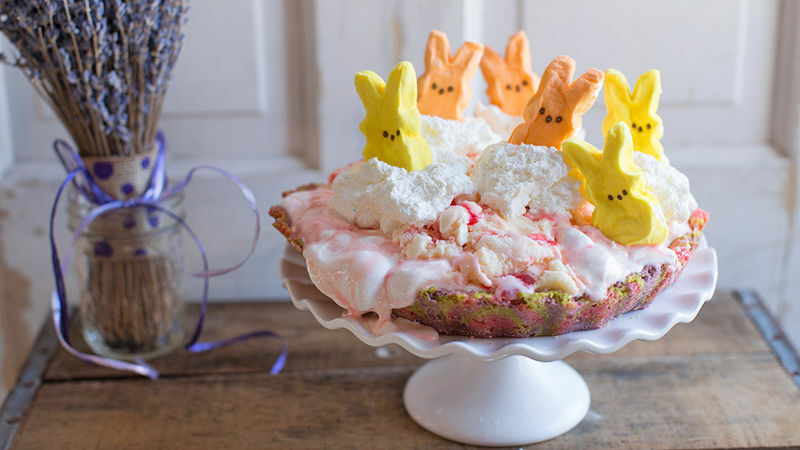 Just before serving, dollop the pie with whipped cream and place Peeps® marshmallows right in the middle. Serve. If you wish to remove the crust from the pie plate, do so before filling. Just run a knife along the edges of the crust and gently work it out of the pie plate. Fill as directed. Feel free to use you favorite ice cream. Vanilla, chocolate, peanut butter, whatever! 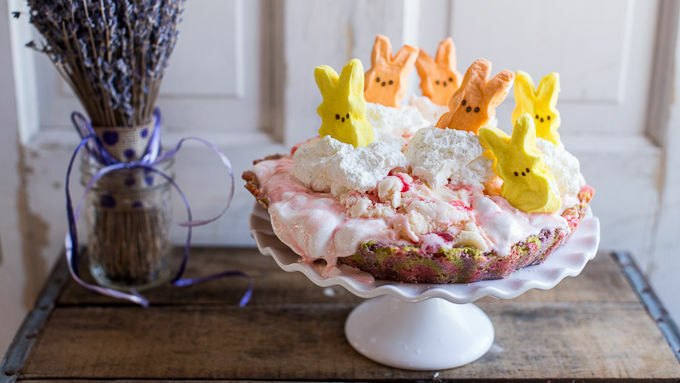 Perfect for Easter or any spring event, this dessert is dressed to impress. Can you believe that spring is almost here? 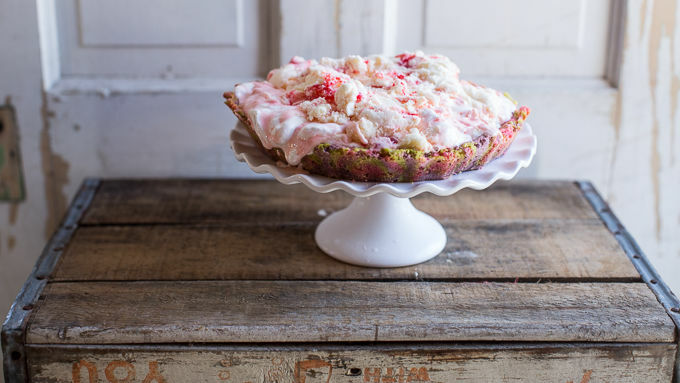 I know a lot of you have had a pretty rough go this winter, especially the eastern half of the country, but I’ve got a colorful pie to kick out those winter blues and get your spring started on the bright side! Growing up, my mom used to put Peeps™ in our Easter baskets. For me, it’s just not Easter without Peeps™. I love their pastel colors. They make me happy just looking at them. Kind of like the way flowers make me happy, but with Peeps™ I get a sugar high too! Awesome. This all leads me to THIS incredible pie. 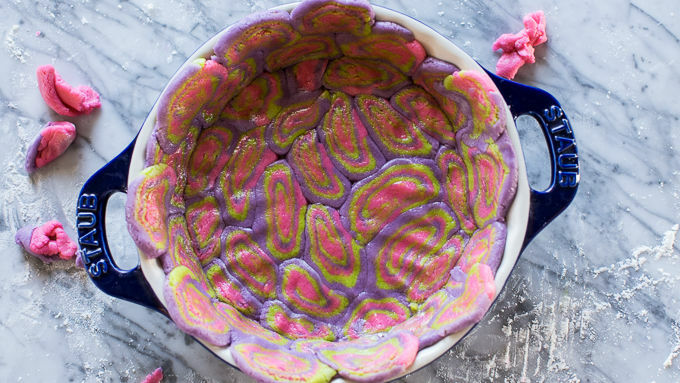 It’s all things Spring and Easter – but in a pie full of color and sweetness. And the crust? Oh my gosh, it’s made with sugar cookie dough! Even better, I colored the dough and rolled it up cinnamon-roll style to make this uniquely delicious base that's filled to the brim with strawberry ice cream and marshmallow fluff. It's just TOO good! PEEPS is a registered trademark of Just Born, Inc. All Rights Reserved.